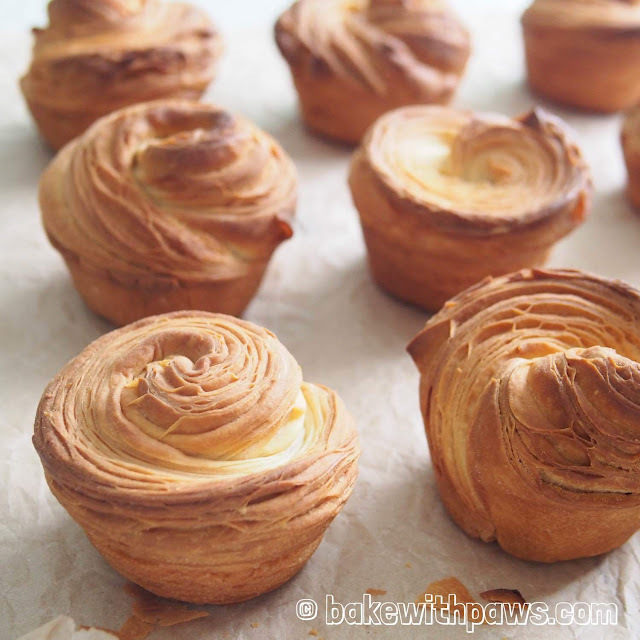 I recently discovered Cruffins and it is a croissant muffin baked in a muffin pan or case. It can be filled with a variety of jams, curds or creams. Plain Cruffin can be served with jam too. According to Wikipedia, Cruffin was originally trademarked in 1993 by a PF Brands, Inc, from Delaware, then later again by Wholesome Bakery in Canada, though there is no evidence to show whether these companies ever produced a pastry with the title. 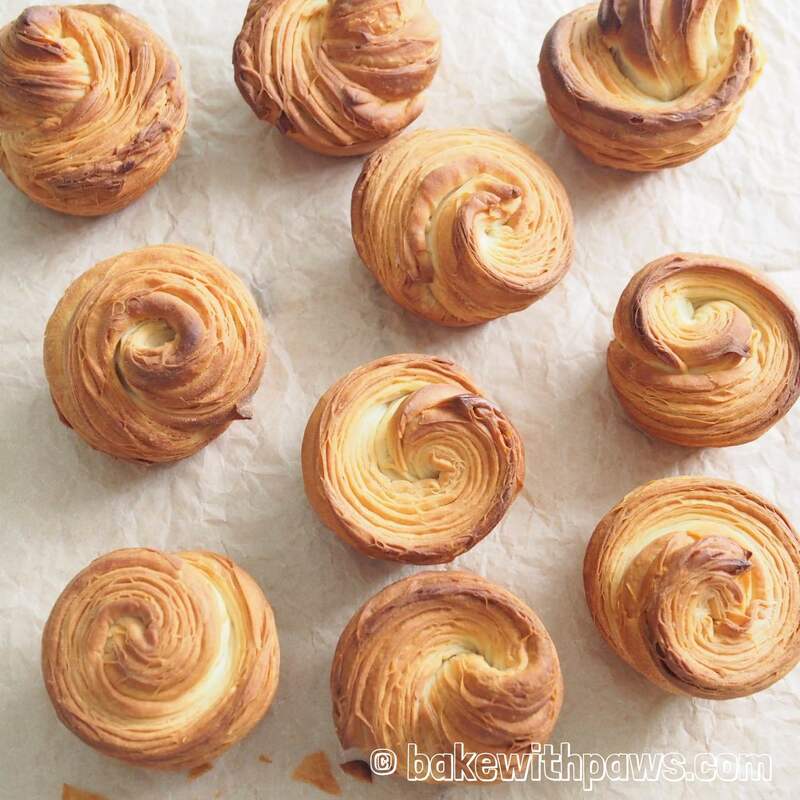 The modern Cruffin we know today was created was by Kate Reid of Lune Croissanterie in Melbourne, Australia in 2013 and was later popularized and trademarked by Mr. Holmes Bakehouse in San Francisco. 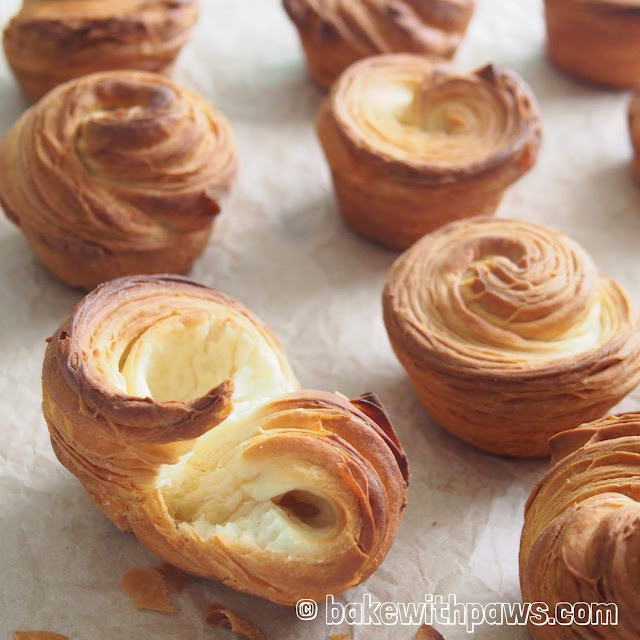 This recipe produces Cruffins with a crispy crust with soft and buttery insides. The method is adapted from Lady & Pups by using pasta machine. I used my own sponge dough method recipe which I think yields a more bread like texture while preserving the crusty exterior. Combine water, yeast and sugar in a mixing bowl. Then mix in bread flour and knead with your hand for few minutes until smooth. Roll into a ball and place in a greased bowl. Cover with cling film and let it prove for 1 hour in a warm and dark place. Put all ingredients (start with salt, flour, yeast, sugar, milk powder, 90g water, butter and sponge dough) into the bowl of stand mixer. Using the dough hook on a stand mixer, knead until the dough comes together, become elastic and tacky but not sticky. Tacky dough behaves sort of like a Post-it note, sticking to a surface but peeling off easily. It takes around 15 minutes at medium speed. If the dough is too dry, add 1 tablespoon of water at a time. 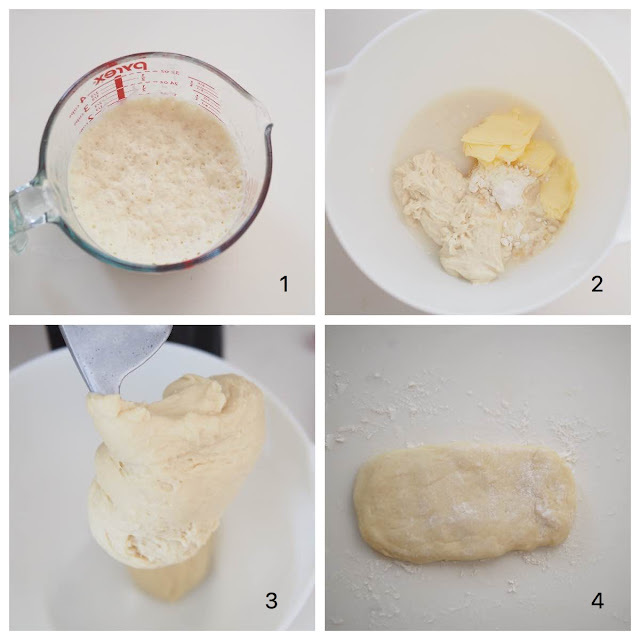 Transfer the dough to a clean and slightly floured surface then divide into 5 equal portions. Work with one portion at a time. 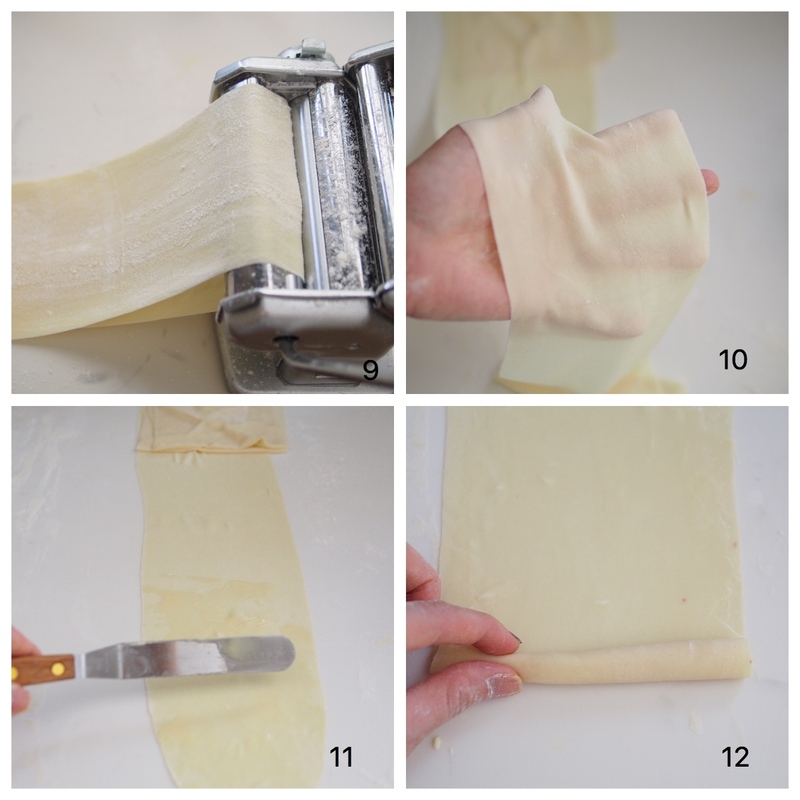 Flatten the dough and roll into a flat rectangle shape that fit into the pasta machine. Dust the dough with enough flour. 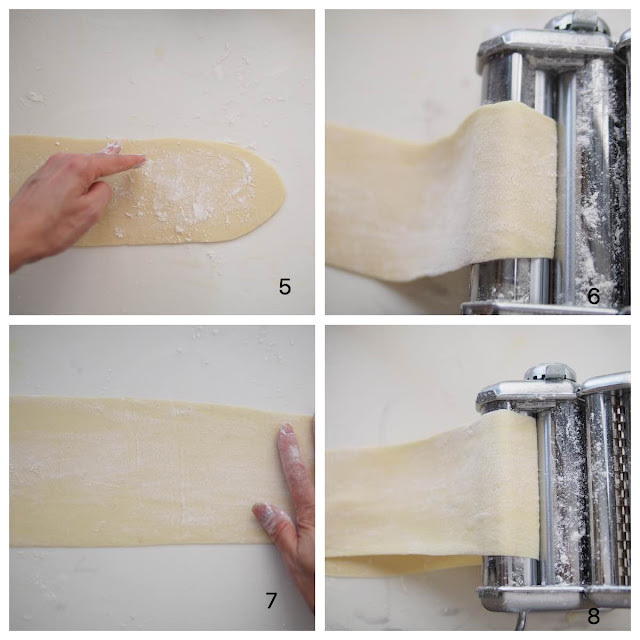 Flatten each dough by passing it through a pasta machine a few times until you achieve a long and paper-thin dough. Start from the thickest setting and then adjust downward to the thinnest. Make sure to keep the dough well-floured to avoid sticking on the machine each time. Lay the dough flat on the counter if you have a very long counter. Otherwise, fold few folds at one end of the dough so that it can fit into your counter top. Spread a thin layer of butter (soft room temperature) on the flat dough surface evenly with spatula or hand. 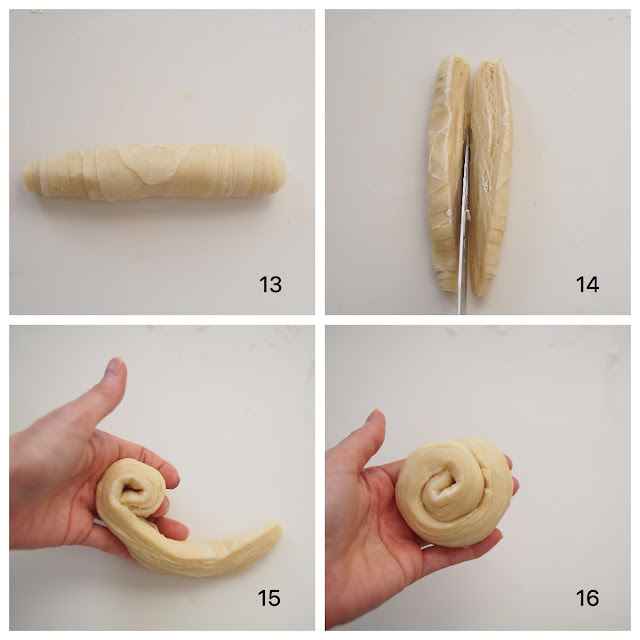 Once finished, roll the dough from one end to the other like swiss roll into a firm log. Using a knife, cut the log in half length-wise. Twirl it into a semi-knot with the cut-side facing outward then tuck the ends underneath. 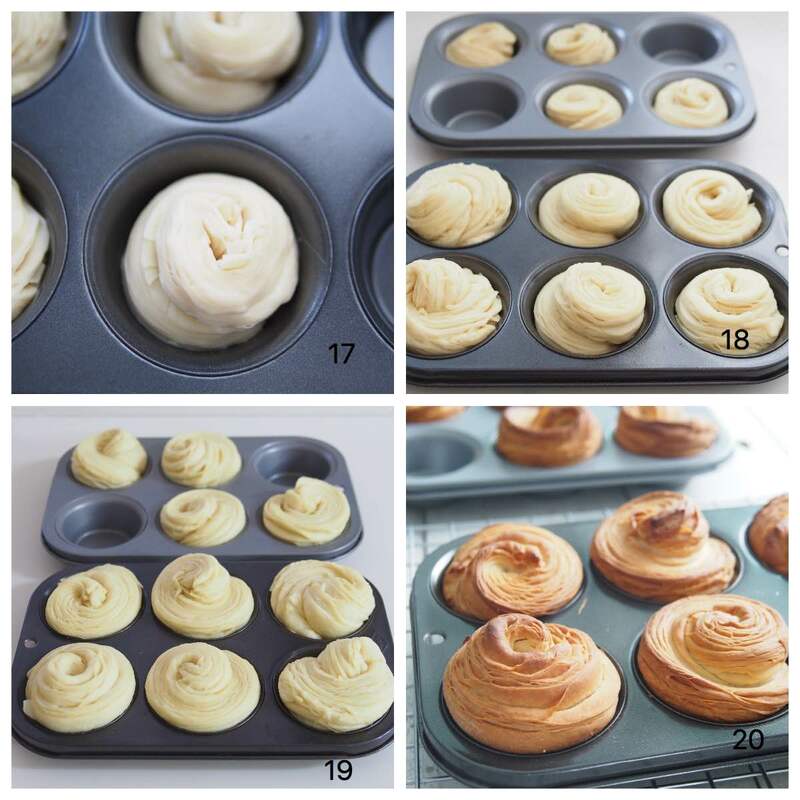 Place the dough into the muffin pan. Continue the rest of the dough until finish. Cover the muffin pans loosely with cling film or kitchen towel and let them proof for 2 hours until double in size in warm place. Bake at preheated oven for 20 to 25 minutes, or until golden brown. Remove from oven and let them cool on rack. You may sprinkle some icing sugar on top before serving or serve together with jam. Hi, when do we fill the jam? Spread on the dough before we twirl it (pic 15)? or just dab it on the top and let it rise? Thanks for dropping by. I have not tried the cruffin filled with jam yet. If I am not wrong, should be using a piping bag fitted with a medium round tip to fill in the jam after baking. WHAT THE WHAT?!!!! I have never seen anything like this! I am definitely pinning this recipe! This looks great! Thanks for dropping by. You can roll the dough with rolling pin. But, very hard to achieve the paper thin dough. I have seen people using rolling pin.